Tickets to the Olympic Games are now on sale and Foreign Office staff around the world are marking this key milestone in the run-up to London 2012. The application process for tickets to the London 2012 Olympic Games will be open from March 15 until 26 April 2011. People buying tickets in the UK can apply at any point during this period. Residents outside the UK and designated European countries should apply for tickets through their local National Olympic Committee or its Authorised Ticket Reseller from 15 March. Find out more about buying tickets here. Foreign Office Minister for Public Diplomacy Jeremy Browne has recorded a video message for the 500 day milestone. Watch this below. Lord Sebastian Coe has already recorded a video to mark the occasion - watch it here. 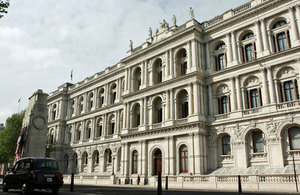 Foreign Office staff around the world are marking the 500 days to go point with a wide range of activities. Many are meeting with sporting officials to commemorate the date - the British Embassy in Hanoi called on the Vietnam Olympic Committee, while British Ambassador to Iraq Dr John Jenkins met Iraqi officials to mark the milestone. For example, Mexico is holding a photography competition that will invite people to photograph the UK and show an image which represents us as an open, diverse, connected and creative country. Germany will be promoting 500 days to go at Berlin International Tourism Fair, and St Petersburg are running a ‘Summer meets Winter Olympics’ event including a volleyball in the snow competition. Our Embassy in France is holding a big debate on the importance of education and sports to encourage young people to think about these issues. Malaysia is commemorating the occasion by signing an agreement between the British Council and the Malaysian Ministry of Council promoting the International Inspiration Programme, which aims to transform the lives of 12 million children of all age groups and abilities in schools and communities. Ambassador to Washington Nigel Scheinwald has blogged for the 500 days to go milestone, along with Ambassador to Armenia Charles Lonsdale and Ambassador to the Netherlands Paul Arkwright.